Even before you get to the product, Targus has included a special feature in their box that makes this product even more purchasable when seen in the store. The box contains an actual size Targus keyboard printed on the flip out portion of the box. This is great so that you can see how large the keyboard is and how it is really a full sized qwerty keyboard. Along with this, just about every feature of the keyboard is outlined on the box. There are no surprises on how this keyboard should look and feel as everything is specified and often is the same as what the specification for a desktop or laptop keyboard would be. What really sets the Stowaway apart from other PDA keyboards is the quad folds and sliding sections of the keyboard. 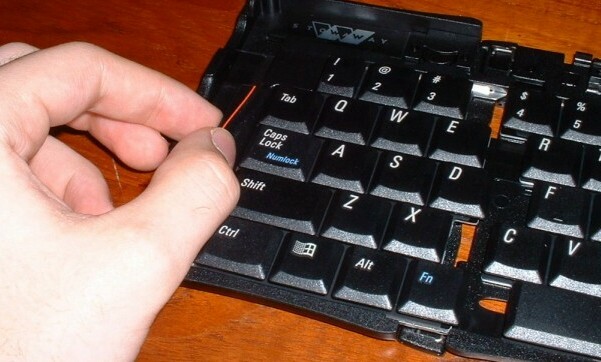 After unlatching the locked case, the keyboard opens and folds out easily into a split form. Just after opening the keyboard is in three sections. To make it a standard size keyboard, simple press the two red bars toward each other and viola, the keyboard locks into place and is ready to go. The mechanism for holding your device (in my case the iPAQ) pops out from the back of the device and the connector flips up to lock into the devices sync port. To restore the keyboard to its close form just requires the device rest to be folded in and the two red bars to be pulled apart. 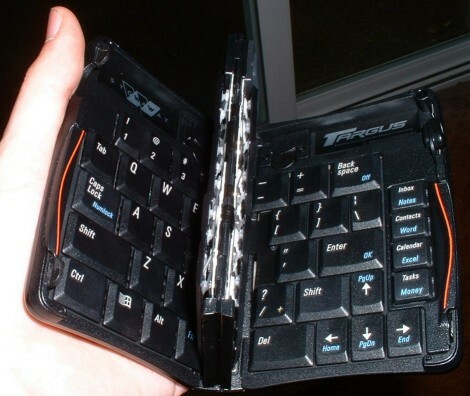 Fold up the keyboard, and within seconds it is back to its form to storage or transportation. The first thing that is easily noticed when you first use this keyboard is the size and feel of the keys. There is nothing to get used to or adjust for. 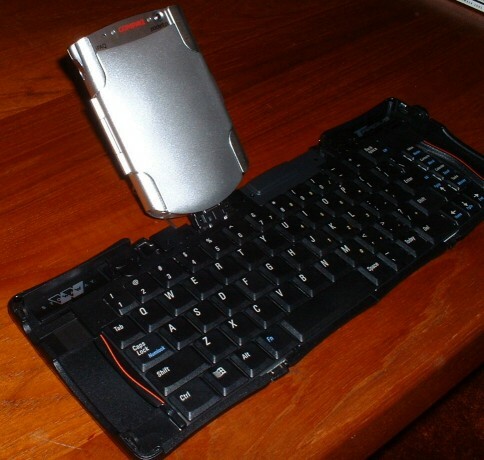 Though this might not be the case if you strictly use a desktop with cheap keyboard, but for me who often uses laptops, desktops with substantial standard keyboards (non-ergonomic) or different keyboards, it requires no adjustment. The keyboard is fully featured as well with all the standard keys, including a number keypad. It also includes four keys for quick starting applications (thought each key can launch two applications). One perk that I had been hoping for, but only is included with some devices, is the ability to instantly plug in the keyboard instead of having to install the application from the desktop. The application has similar on-device support to that of other PDA keyboard I have used but is a more advanced version that better masks itself (does not appear when you turn on your device). I actually didn't even look at the on-device support until after using the keyboard for a number of weeks. It does allow for the user to change the quick start buttons/function keys if you use other applications for tasks other then those included with your device. I was pretty mad when the AC cord wouldn't plug in, especially when it said on the box you could power your device while you worked. Come to find out when I was flattening the box, there is an AC adapter encapsulated in the Targus box that makes it so your device's AC adapter can be plugged in. The adapter uses an L style plug in to turn the connector at a right angle. One worry the some users might initially have is that they would be forced to use their device without a jacket like some keyboards require. That is not the case. 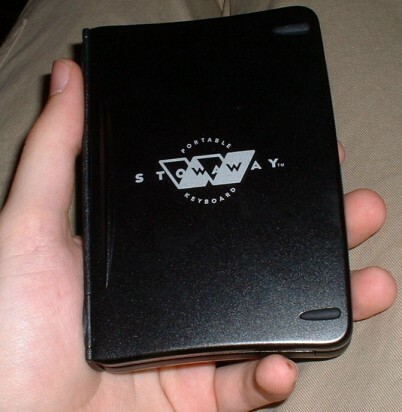 If you use nothing or something as big as a PCMCIA jacket, then you will be fine. 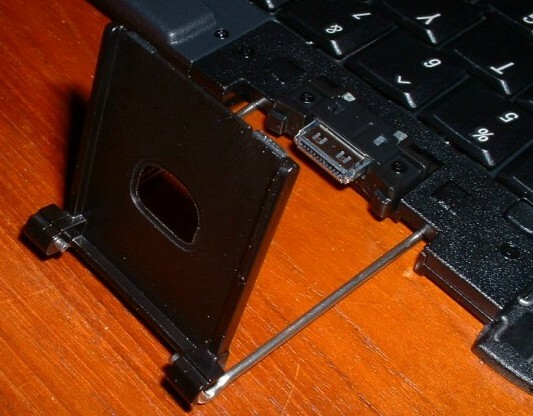 I fear that users that use something like a dual PCMCIA jacket or GPS sleeve with their iPAQ, you might not be able to use it and that Stowaway at the same time. 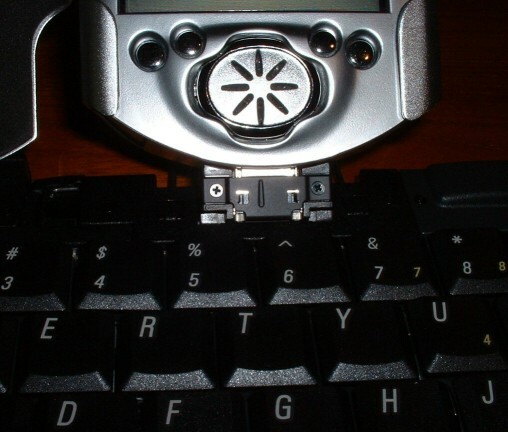 The keyboard works great with many devices that are in cases, such as the Proporta Aluminum iPAQ case (that leave the sync port open). It seems to me that Targus is a company looking to the future and giving users easy options for product upgrades as best they can. 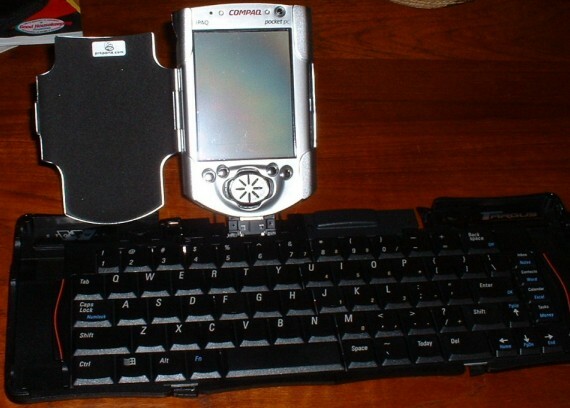 When the 3800 series iPAQ was released, which contains a different size sync connector, Targus instantly release and inexpensive upgrade connector that upgraded the 3600/3700 keyboards to work with the 3800's. Now, Targus is even including the adapter (for free) with their iPAQ Keyboards. Though I will never use it as I don't plan to upgrade to a 3800 or 3900 series iPAQ, it really shows me Targus's dedication to the user. Overall, there really isn't anything else I would have wanted from this keyboard. That is why I bought it. Everyone raves about these (as am I) but there is good reason to. I really feel like I can say with this product that if you need a keyboard for your device, that you would be very happy with this one. This means, this product is the best (in my opinion). Accept no substitutes. Their might be competitors that try to beat this product, but no combine everything of this product. Though you still should consider it for yourself, most would be happy with this product even if they were unable to try it prior to purchase.